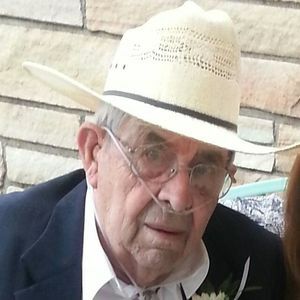 STERLING – Lyle S. Frank, age 94, formerly of Tampico died Friday January 11, 2013 at CGH Medical Center in Sterling. Lyle was born on May 8, 1918 in Tampico the son of Fred E. and Eunice (Goble)Frank. He married Helen L. Covell on November 29, 1939 in Tampico. She died July 30, 2012. Lyle was a farmer for over 70 years in the Tampico area. Survivors include one daughter, Gloria (Ronald) DeValle of Sterling; two sons, Frederic Errol (Beverly) Frank of Annawan and Stanley (Phyllis) Frank of Surprise, Ariz.; ten grandchildren; numerous great and great, great grandchildren. He was preceded in death by his parents; wife and son Dennis Frank. Visitation is from 10:00 – 11:00 A.M. Wednesday January 16, 2013 at the McDonald Funeral Home in Prophetstown. Funeral services will be 11:00 A.M. Wednesday at the funeral home with Pastor Isaac Newman officiating. Burial will follow at Tampico Memorial Cemetery. In lieu of flowers a memorial has been established to Resthave Nursing and Retirement Center and the Alzheimer's Association.